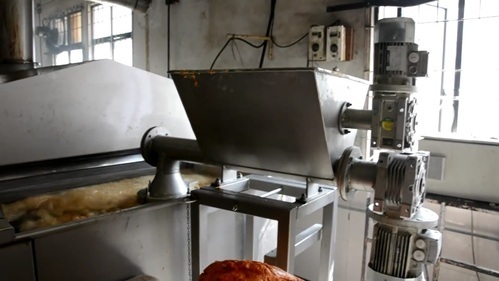 Automatic Nylon Sev Extruder Machine, Mainly used in Continous Fryer Machine for making high quality and high production namkeen snacks production. Type Of Namkeen Boondi, Fafda, Masala Chana, Nylon Sev,Ratlami Sev,Bhjia etc. Nylon sev also known as plain sev, zero sev, agra sev or thin sev, this savoury is prepared using chick pea or Bengal gram flour. This adds crunchiness when added to chaats like bhel puri, papdi chaat, dhai puri et cetera. Combining the technology, style and comfort at a same time, we unfurl our wide range of sev extruding machines, which find their application for extruding the dough to produce very fine sev effortlessly and in minimum time. Sturdily constructed from high grade metal, these automatic machines ensure reliability, durability and zero defects. These machines are most competitively priced. A unique brass cylinder is along with different interchangeable dies. A fine-tapper holed die is attached to the container and filled with dough, which is then pressed into hot oil where it fries into crisp nylon sev. The nylon sev making machines are supplied with three dies which may be - thin, medium & thick. Grace Food Processing & Packaging Machinery is leading Supplier, Exporter and Manufacturer of Automatic Packaging machine and Food Processing Machines. Our Main Products are Snacks Food Extrusion Line, Snacks Food Frying Process, Snacks Extruder, Corn Puff Extruder with Single Screw Extruder and Twin Screw Extruders, Continous Namkeen Fryer Machine, Murukku Making Line, Murukku Frying Line, Seasoning Applicaton for Various Snacks, Conveying System, Packaging Systems for Food and other product in form of Liquid, Granules and Powder.We also offer Automatic Pouch Packaging Machines, Corn Puff Snacks Extruder Line, Kurkure Snacks Extrusion Line, Automatic Snacks Fryer Line, Popcorn, Pasta Making Machine, Potato Chips Line, Tortilla Nachos Processing Line & Namkeen Processing Line etc. Automatic Form Fill Seal Machines, Form Fill Seal Machines, Horizontal Form Fill Seal Machines, Seal Packaging Machine, VFFS Machine, Multi head Weigh Filler Packaging Machines, Collar Type Packaging Machine, Vertical Form Fill Seal Machines, Automatic Packaging Machines, Packaging Machinery, Pneumatic packing machines, liquid packaging machines and Food packaging machines. Manufacturer and exporter of a qualitative range of Food Processing Machines like Kurkure Extruder, Cheese Ball Extruder, Puff Snacks Extruder, Fryums Machine, Soya Nugget Extruder, Vermicelli Machine, Food Extruder Machine, Snacks Machine, Pasta Macaroni Extruder machine, Popcorn Procesing Machines, Noodles Extruder Machine, Rotatory Roster Machine, Continuous Flavor Coating Machine, Coating Pan, Conveyor, Continuous Conveyor Dryers, Oven Tray Dryers Machine, Food processing machinery from India, Automatic Snacks Food Processing Plants. Grace Food Processing & Packaging Machinery is leading Supplier, Exporter and Manufacturer of Continous Fryer machine, Namkeen Fryer machine, Automatic Namkeen Fryer, Pellet Frying Line, Potato Chips Frying Line, Banana Chips Frying Line, Extruded Snacks Frying Line, Automatic Continous Fryer. We also manufactuer Popcorn Processing Machines, Air Popped Popcorn Popper Machine, Kettle Popping Popcorn Machine, Hot Air Popcorn popping machine, Oil popped poppers, Caramel coater, Automatic Popcorn Processing Line. Pasta Making Machine, Automatic Pasta Plant, Pasta Macaroni Making Machines. Pouch packing machine manufacturers India, Automatic FFS, Form Fill Seal machines, Masala pouch packing, powder packing & pouch filling machine, pouch packaging and liquid packaging machines Exporter. Snacks packing machine, Powder filling machines, Pouch packing machine, Packaging machines manufacturers, Packing machines India, Shrink packaging systems, Masala packing machine, Powder packing machine. Pouch Making Machine, Pouch Filling Machine, Shampoo Filling Machine, Zipper Bag, Biscuit Wrapping Machine, Packaging Machines India, Tea Packaging Machine, Coffee Packaging Machine, Sugar Packing Machine, Pouch Packing Machine India, Packaging Machine, Exporter Packaging Machines India, Vacuum Packaging Machine, Seal Machine India, Stick Pack Machine, Packaging Machine Manufacturer India, ffs machine, pouch packing machine, packing machine, packing machines, sachet machine, packaging machines.